Feeling at times only slightly shorter than The Hundred Years’ War, Ivo von Hove’s latest production (by Toneelgroep at the Barbican until 1 May) is an epic four-and-a-half-hour-long retelling of Shakespeare’s Henry V, Henry VI (all three parts) and Richard III performed in Dutch with English surtitles. Still here? Good. This isn’t a production to be taken lightly but, if your backside can handle it, this play is definitely worth the ride. The Belgian director is already a West End darling thanks to his triple-Olivier award winning View From The Bridge and here his imaginative approach to theatre is allowed to run riot. There is no doubting von Hove’s ability to turn Shakespeare’s text into a vibrant experience. Those wondering where George RR Martin picked up his inspirations from should pull up a pew and immerse themselves in this real game of thrones. There are grand battles and gruesome murders, murky machinations and political matchmaking. Wars are won, countries are lost and crowns fall with the speed and coldness of winter rain. Through all this, the human factor is never forgotten. This is very much an abridgement of the Bard’s originals but here, less is more, and it is rarely less than gripping. We go over the top and once more into the breach with Henry V (Ramsey Nasr) then watch the weak-willed Henry VI (Eelco Smits) falter, fall and die at the hands of Richard III (Hans Kesting) who takes the crown in heinous fashion. Nasr does well to bring out Henry V’s moral tone and his difficult dilemmas, and Smits encourages pathos by the palletload. It is Kesting, though, as the amoral regal climber who takes our breath away. Portraying Richard as a stooped man with a large facial birthmark wandering around in tight trousers, he dominates the stage as the epitome of malevolence before and after his ascension to the crown. This isn’t von Hove’s first "Shakespearathon": in the same venue, he directed Roman Tragedies in 2009 which compressed Coriolanus, Julius Caesar and Antony and Cleopatra into a seamless whole. In her review, The Guardian’s Lyn Gardner called it “an exhilarating pleasure” and “about as good as theatre gets” ; considering that the play lasts six hours without an interval, it is tempting to put that hyperbole down to Stockholm Syndrome but von Hove has an uncanny ability to keep the drama flowing with little in the way of drag. In the case of Kings of War, this is partly down to the theatrical parlour tricks the director employs throughout. As well as on a largely bare stage, action takes place out of direct sight in corridors behind and around the visible area. A large video screen keeps us up to date on what is going on, as well as intercutting and underlining the plot points with specially filmed scenes. Cameramen occasionally invade the stage to stream live footage of the characters as they go between struggling with entire countries to fighting against each other. Trumpeters, a DJ throwing out bass rhythms and a metronome provide successive sonic accompaniment as we cascade down the generations and go from the brash triumphalism of Henry VI to the dark dankness of Richard III’s climb to power. There are a few faults but nothing fatal. Tracking who said what means continuously flicking one’s eyes from the surtitles high above the stage and back down which becomes tiring and confusing after a while, especially in the more populated scenes. The set designs for the Henry V section ccasionally make it unclear whether we are seeing the English or the French side; the to-and-fro verbal battle is also at times an uneven and frustrating affair. Finally, the translation into Dutch loses some of the rhythm of Shakespeare’s original speeches. 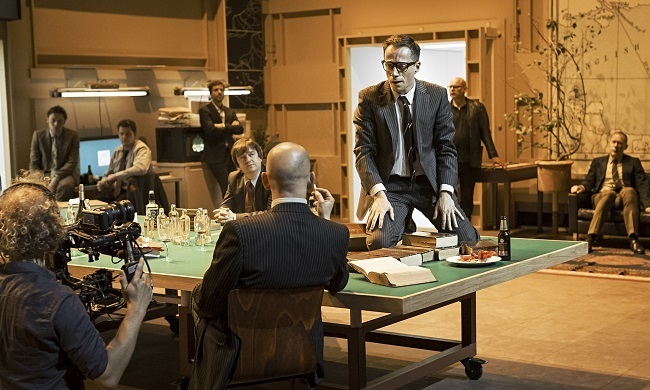 If you can live with these, Kings of War is a thrilling example of the power of modern theatre. Kings of War runs at the Barbican, Silk Street EC2Y 8DS, until 1 May. Tickets £16-£50. Londonist attended on a complimentary ticket.